See our new Stop Topping videos (in both English and Spanish)!! Go to 'Projects' and then Public Education to view - email us if you're interested in having this video. 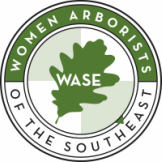 Women Arborists of the Southeast is dedicated to the promotion of women in the profession, mentorship for girls interested in arboriculture, and outreach programs for the general public.